DAVE: Although you have continued to remain quite busy making music, it has been thirteen years since the last proper Luna album, RENDEZVOUS. What led to band’s reunion in 2015 and the decision to embark on a pair of much-welcomed releases now? DEAN: Hmmm, it was the 10-year-mark since the band broke up, so that gets you thinking. . . and a Spanish promoter wrote to me: there is a rumor that Luna is re-forming, is it true? If so, I can offer you a tour. And I said, well it’s not true, but it could be true if you want it to be. And everyone jumped at the idea. And we had fun; honestly we enjoy each other’s company now and take greater pleasure in playing live. DAVE: You are absolutely no stranger to tackling the material of other artists. Were there criteria in place for selecting covers to consider recording with the band? DEAN: No absolute criteria, but the important question is always — can I sing this song without making a fool of myself? There are things we’ve tried in the past (like Led Zeppelin) that didn’t really work. Mostly these are obscure songs (except perhaps the Dylan track “Most of the Time” which everyone seems to know from the High Fidelity movie that I have never seen). I guess I do like to pick obscure songs that I think deserve to be heard. DAVE: Since Dylan’s recording of “Most of the Time” was born inside the dreamy sonic realm of producer Daniel Lanois, did you see it as an obvious piece to deliver in a musical sense, or was this chosen on the sheer power of Dylan’s words and storytelling? DEAN: This one was Sean’s idea. And was a really hard one to sing. I’ve always loved the Dylan version, but at first I wondered how on earth we could do it justice. There’s not much melody to grab onto so it’s hard to even identify the correct notes; it’s really about atmosphere and story and I had to figure out how to talk my way through it. That’s what Dylan did; it’s a performance that is acting just as much as singing. Each line is precious and has to be delivered just so, or tossed off as if it’s meaningless when in fact the narrator is crying inside. DAVE: By name, A SENTIMENTAL EDUCATION sounds like it may have been intended as a group of very obscure yet significant songs that you felt should not go unheard. Was musical education and exposure a driving thought here, or are these simply songs that strike a sentimental chord with you as an artist? DEAN: Well I don’t mean to lecture; really it’s my own sentimental education, not a lesson for others. There are songs on the album by bands that were important when I was young (like the Cure) and songs by artists I’ve only recently listened to (like early Fleetwood Mac — a whole world of material before Buckingham and Nicks ever joined). 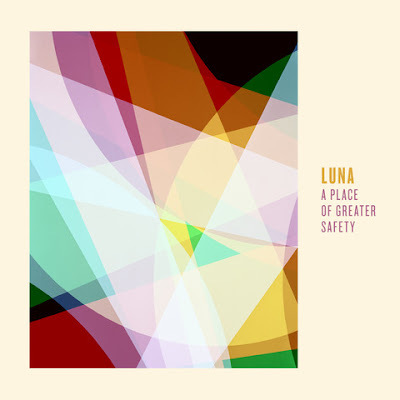 DAVE: Can the instrumental EP, A PLACE OF GREATER SAFETY, be seen as an indicator that fully fleshed-out original Luna songs may also be on the agenda? DEAN: No, the instrumental EP is just an instrumental EP! I really enjoyed not putting lyrics on these, trying to make them melodic and interesting without a vocal. Sometimes a vocal just ruins a good piece of music (though of course sometimes it makes it). DAVE: Given your recent history with crowd-funding programs such as PledgeMusic and the current variety of album and single configurations available for an artist to release… from all things digital to all things analog… what’s your take on today’s music marketplace and which formats do you believe have the greatest impression on the listener? DEAN: A former Luna manager said to me the other day “thank god for direct-to-fan sales.” We didn’t exactly crowdfund; we made the album over the course of the year, paying for it with money we earned playing live. But using Pledge Music helps us recoup those costs very quickly by selling some special items to fans who seem to like buying directly from us. That’s only part of the equation, the records will still be in stores come September 22 and that’s still gonna be the majority of our record sales. And most people will just listen on Spotify or Apple Music or YouTube. That’s the world we live in. As for formats, each format has something to offer: vinyl is special, compact discs are still a very consistently good-sounding option and that’s what I usually buy (though of course more and more people don’t have any way to play them). But most of us listen on our computers, bouncing from song to song by different artists. DAVE: In regards to songwriting, do you approach the writing process differently when composing for Luna as opposed to a solo project or even a Dean & Britta project? DEAN: With Luna it’s all about what happens live; we write songs by getting in a room and seeing how far we can take a simple idea. Well that’s where it starts — of course there is always the lonely activity of writing lyrics, which is not generally a collaborative activity. DAVE: The Velvet Underground’s impact has consistently weighed heavy on your creative output. Not only did you dive in completely to the 13 MOST BEAUTIFUL... SONGS FOR ANDY WARHOL’S SCREEN TESTS project, but you also worked closely with Sterling Morrison and toured in support of Lou Reed and even the Velvets in the 1990s. 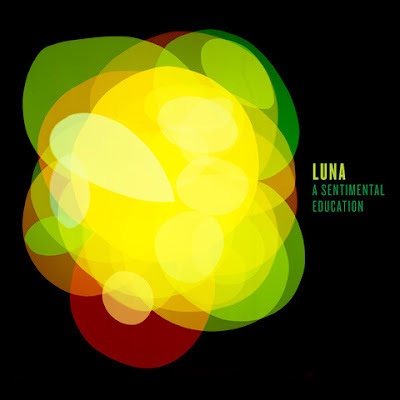 Do you feel that aspects of your work, either as a solo artist or in groups such as Luna or Galaxie 500 have similarly influenced the next generation of up-and-coming bands today? DEAN: Galaxie 500 is probably bigger than ever; those records seem to appeal to younger kids and are always being re-discovered. And they hold up well, they just feel like something very different. I see that when I go out to play Galaxie 500 songs, it’s a young crowd that shows up. Seems we had an influence in England especially, I meet people who started bands after seeing the band play. They probably could see how easy it was to play the songs! I know James Murphy of LCD Soundsystem (probably my favorite band today) is a Galaxie 500 fan, but you sure don’t hear it in his music. DAVE: In parallel to that, are there any bands today that have provided influence or direction to you in the contemporary music scene? DEAN: I have been working these last few years with Jason Quever of Papercuts, who produced the new Luna recordings. I like him because he’s as opinionated as I am; we dislike a lot of the same bands. And I guess he would say he was influenced by Galaxie 500 but I feel like I’ve been influenced by him too. You learn from everyone you work with (if they’re good) because everyone has different tricks. I sure learned some things watching Jim James work too (he produced another record of mine). DAVE: What does the future hold for Luna and Dean Wareham? DEAN: We really have not discussed long term plans. 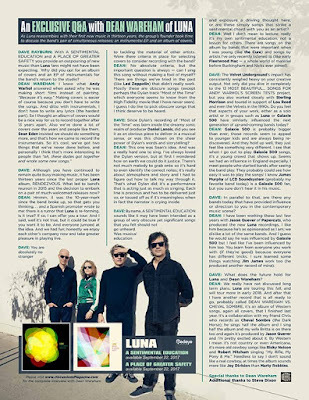 Luna are touring this fall, and will tour more in early 2018. And after that I have another record that is all ready to go, probably called DEAN WAREHAM VS. CHEVAL SOMBRE, it’s an album of Western songs, again all covers, that I finished last year. It’s a collaboration with my friend Chris who records as Cheval Sombre (the Dark Horse); he sings half the album and I sing half the album and my wife Britta is on there too and again it’s produced by Jason Quever and I’m pretty excited about it. By Western I mean it’s not country or even Americana, it’s more old cowboy songs like Ricky Nelson and Robert Mitchum singing “My Rifle, My Pony & Me.” Needless to say I don’t sound like a real cowboy, at times the album sounds more like Joy Division than Marty Robbins.